By Magdalena Jablonska, Suntech S.A.
With SunVizion Network Inventory, which works with ArcGIS 10.3 for Server, all entities engaged in operating a broadband network have access to data with multiple levels of detail. By 2020, every European is supposed to have access to the Internet with a minimum download rate of 30 megabits per second, according to the Digital Agenda for Europe. Poland is currently the biggest broadband network construction site in Europe, with both municipalities (gminy) and provinces (voivodships) building these networks. The municipal office in Bielsko-Biala, a picturesque town in southern Poland, has implemented an Esri-based system to inventory all the resources in its broadband network, including devices, cables (their location, size, type, and attenuation parameters, for example), and infrastructure (such as buildings, cabinets, cable chambers, manholes, and utility poles). Suntech S.A., an Esri Silver Tier partner, used its SunVizion Network Inventory to map out the municipality's entire broadband network so that, as the municipality expands its Internet services, it will be able to better manage its network infrastructure, reducing maintenance costs and streamlining business processes. Bielsko-Biala's broadband network was actually built in 2014. It has a high-performance fiber-optic backbone, and its distribution network has radio access elements and access nodes for future broadband operator installations. The network is designed to meet an array of local government requirements, including providing public e-services, such as online permitting; hooking up municipal administration buildings to one another; and connecting schools to other educational institutions, including social assistance centers, cultural organizations, and libraries. It also advances the idea of Bielsko-Biala being a smart city by allowing the future installation of more than 90 monitoring points that can be used to intelligently manage road traffic by, for example, notifying drivers of commute times and alternate routes and showing estimated bus arrival times. Additionally, part of the network's passive infrastructure makes portions of it available for other telecommunications operators to lease at market value so they can offer broadband services to their customers. To ensure that the broadband serves the town's population effectively, the telecommunications companies that offer network-based services need access to detailed information about network assets, including the layout of the cables and data about where network devices are located, as well as the devices' parameters. And they need this information on the spot. This kind of access can only be provided by a network inventory system. It is difficult to conduct network inventories of municipal and provincial networks because various public and private entities are involved in managing and operating them. In Bielsko-Biala, for example, the municipal office owns the broadband network, but a network management company runs the network and various local operators lease individual sections, or elements, of it to provide their own services. Unsurprisingly, this requires complex access rights to ensure data security and user privacy. The SunVizion system was designed to serve networks built by local governments and is thus well equipped to handle such an assortment of stakeholders. "Two years ago we started to develop a system version intended specifically for that market sector," said Suntech S.A. president Piotr Saczuk. 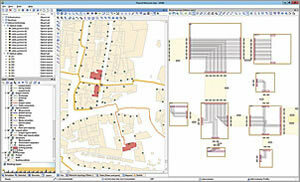 "We can now offer a system that supports practically all tasks related to public networks inventory. Our solution integrates very well with intelligent transport systems and other technologies that support so-called smart cities." SunVizion is devised to facilitate close cooperation and information sharing among the numerous entities managing and using a public broadband network. The system allows network managers to instantly see information about available network resources near a client's residence, which makes it easier to determine service options at the outset and, if a customer experiences issues, reduces the amount of time it takes to give a technical diagnosis. 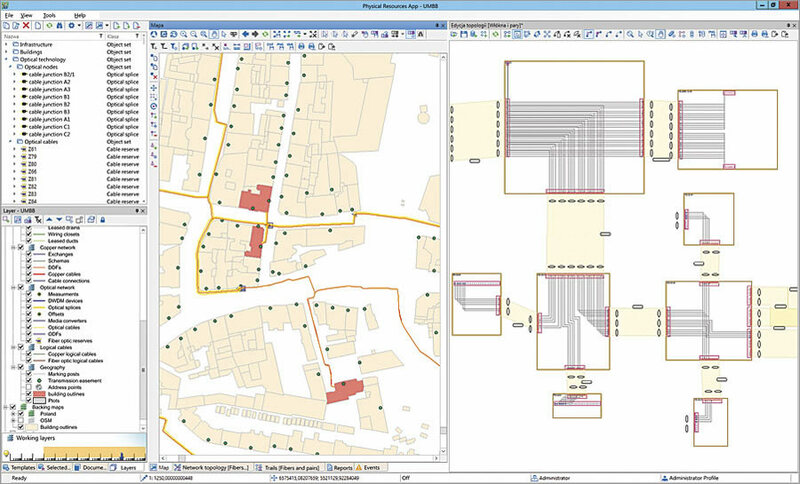 "The SunVizion system allows hierarchical mapping of the entire network system, starting from the manhole and underground ducts and conduits system layer to optical fibers, inside plant resources, or even services," said Tomasz Zwinka, an inspector in the municipal office's IT department. "The SunVizion system has a friendly and intuitive interface and recognizes many data formats, allowing data to be imported and further processed." SunVizion, which works with ArcGIS 10.3 for Server and utilizes a host of other Esri products, employs GIS for the spatial components of network management, including recording network elements. The system goes even further when a customer already uses the Esri platform because SunVizion can be integrated with the client's existing ArcGIS environment. All customers have to do is configure their feature classes and maps to appear in SunVizion and migrate selected geodata into the system's repository. "It is not without significance that the management of all information about the physical and logical network structure, its configuration, status, and operation has been integrated within one system," continued Zwinka. "At present, a program of that kind is essential for proper management of network resources in the areas of network planning and extension, service configuration and performance, failure handling, etc." In the event of a device failure, the digital map of the network—displayed on a client's own system or on ArcGIS Online, complete with full data about the network—makes it easy to identify the location of the failure and shortens the time it takes to remove the device and fix or replace it. Using the geographic data for each device (which is collected along with its technical data), the system quickly defines the extent of the failure by showing which services—Internet and/or telephone—will be unavailable to clients in specific areas. Additionally, a swift analysis of the extent of the failure allows the system to localize the problem so it can be taken care of right away. At the same time, network operators are able to contact clients whose Internet or telephone connections were cut off and provide them with a complete picture of what happened and when they expect the failure to be remedied. A network inventory system can be implemented in two ways: either after the network is built or when the network is under construction. Bielsko-Biala opted for the former, but in retrospect, it appears that the latter is better for the investor. "Implementing the system at an early stage of the investment is much more favorable, as it allows [clients] to make use of the inventory already at the design stage," said Suntech S.A. project manager Marcin Milewski. "The data that is loaded continuously from design documentation makes it possible to monitor work progress. The system offers a global picture of the designed network and may serve as a tool for solving conflicts, if any, already at the design stage." Specialists from the Bielsko-Biala municipal office confirm this view. But no matter when it is implemented, SunVizion streamlines service management, how device failures are handled, and general network maintenance. In Bielsko-Biala, all entities engaged in operating the broadband network now have access to data with multiple levels of detail, but only within the rights assigned to them. This, plus accurate mapping of the entire system, not only makes it easier for regulators to prepare reports, but it also ensures faster and more reliable broadband service—which is exactly what the Digital Agenda for Europe is trying to do. For more information, email Suntech S.A. business development director Radek Domurad.